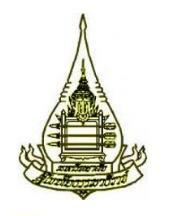 Sukhothai Thammathirat Open University or STOU is one of the two open universities in Thailand. The University was officially established by Royal Charter on September 5, 1978 under the name Sukhothai Thammathirat Open University. The university has designated September 5 of each year as the commemorative date of the university’s founding. As the eleventh state university, Sukhothai Thammathirat Open University has all the honors and privileges of other universities. It was the first open university in Southeast Asia to use a distance teaching/learning system. Sukhothai Thammathirat Open University was established as a state university to provide the people with increased education opportunities at university level. His Majesty King Bhumibol Adulyadej, King Rama IX, bestowed the name “Sukhothai Thammathirat Open University” in honor of King Rama VII, one of whose titles before his accession to the throne was “Prince Sukhothai Thammaraja”. Sukhothai Thammathirat Open University aims at being a leading world-class open university that employs distance education to make lifelong education available to all. To develop the country’s human resources at all levels. To strengthen communities, organizations and social institutions so they can participate in a knowledge-based society. To research, promote and develop the body of knowledge and local indigenous wisdom available to Thai society. To preserve, promote and develop Thai arts and culture.